Are Unpaper Towels Worth It? Before I dive into this too far, let's address whether or not unpaper towels are worth it. You have to wash them, they cost more up front, etc. In my opinion completely, but it depends on what your priorities are. It is important for me to use less paper and decrease my environmental impact so the initial cost and inconvenience are completely worth it for me. After some trial and error I came to the conclusion that I needed two different types of unpaper towels for two different types of jobs. First is a Super Absorbent Unpaper Towel for cleaning up really liquidy messes and second a Good for Scrubbing Unpaper Towel option that is not as absorbent but is better for scrubbing up those tough messes. I love Swedish Dish Towels. They are a great replacement for both sponges and paper towels. Swedish dish towels are my favorite unpaper towel for cleaning up big liquid messes or wiping down counters. These are surprisingly absorbent soaking up nearly 4oz of liquid in my testing (they work best when already damp). These are typically made from natural wood cellulose and sized roughly 8×6.5 inches. These aren't perfect though. When it comes to scrubbing up hardened messes they can get a little ripped up. I wouldn't say these are delicate, they just aren't right for messes that require a lot of scrubbing. If treated well they will last for quite some time. I have several that have lasted for nearly two years! If you need a tougher unpaper towel skip to the Good for Scrubbing section below. 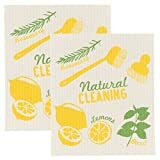 Swedish dish towels come in several colors and are usually printed with an eco-friendly ink in adorable patterns. For example…. The last and most important criteria for me was also having an unpaper towel I could compost and these easily can be once they have worn out! Wowables are another really great super absorbent compostable unpaper towel option very similar to Swedish dish towels (but not nearly as cute!). At the size of a traditional paper towel they are just way bigger than I need them to be for cleaning up liquidy messes around the house. Not to mention they come in fairly large rolls as well. These are another ultra absorbent 100% compostable option similar to the Swedish dish towel but with a more paper towel like finish. According to If You Care these towels will only last for 1 week making them a somewhat more costly solution in the end. You can definitely call this option just a towel, and it is. But, for me there is a distinction that makes it a great unpaper towel. I have towels I am a little precious about getting dirty. This is not one of those towels. This is a practical unpaper towel that I don't have to feel bad about staining or using on a really gross mess because that is exactly what it is for. Rawganique produces high-quality handcrafted sweatshop and chemical free products you can feel good about using. These 11×11 inch cotton towels are a great natural fiber unpaper towel option. They are durable long lasting and made by a company that really takes their impact on the planet seriously. Once these cotton unpaper towels have worn completely out you can simply compost them! This is another great unpaper towel option from Rawganique in a combination of hemp and cotton fiber. However, I don't like the texture of this weave as much as the previous option because it isn't as textured for scrubbing. These are made from 100% organic imported cotton. These are more affordably priced at $8.13for 3 12×12 inch towels. If you are more cost conscious these are definitely a solid cheap unpaper towel option that you can reuse over and over again and then compost them once they are worn out. For me I needed to find something I can thrash, stain, and can clean up the grossest of messes. My current unpaper towel the Bambooee Reusable Bamboo Towel ( Single roll, each roll comes with 20 sheets of Bamboee Towels) works great for cleaning up messes. But they are unfortunately made from a non-compostable bamboo rayon (full bamboo unpaper towel review here). For that reason I decided to find a better unpaper towel I could feel good about using. All of the unpaper towels in those post meet all of these criteria. How many unpaper towels do I need? Have 2-5 unpaper towels of the absorbent and scrubbing variety will be just right for most people depending on the size of your household, pet ownership, and general messing. My preferred unpaper towel storage option is an extra grocery tote bag that I just fill with my unpaper towels and have hanging in the corner of my kitchen so it is handy all the time! Let me know what your favorite unpaper towel is in the comments!